Voting closes tonight - 16 January! : The ‘Battle of Bretton’ is well and truly on in the PT 2014 Sports Awards. 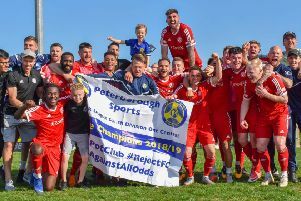 Peterborough Lions Rugby Club and Peterborough Town Cricket Club, who play within a stone’s throw of one another at Bretton, are making a late charge to be crowned Team of the Year. Both clubs had an outstanding year in 2014 - Sports Awards 2014 voting closes on Friday, 16 January 2015. The Lions won the Midlands Division One title and the East Midlands Cup and are also doing very well in their first season in the National League. Town retained the Northants League Premier Division title and reached the semi-finals of the national 20/20 competition. But these two are not the only teams gaining support as the race enters the final furlong. Voting closes at midnight tomorrow (January 16). The Peterborough BCKA kick-boxing club, who won stacks of British, European and world titles in 2014, are also polling well as are the Feeder Soccer Under 10 football team. BCKA also have a handful of individuals picking up loads of votes. They include Freya Molloy and Jade Harris (Junior Sportswoman of the Year), Eddie Paddock (Junior Sportsman), Leon Gold (Sportsman) and Andy Whitwell (Coach of the Year). But a lot can happen in 48 hours.